Freedom’s Live Action Hybrid Jig’s and Spinnerbait’s enhance the action of any favorite plastic or swimbait giving them a life like appeal that fish have never seen before. 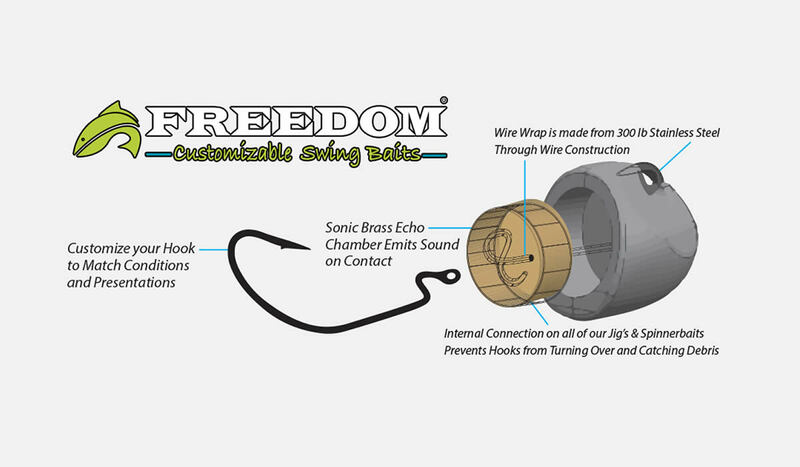 Freedom Tackle Corp. is committed to providing anglers with cutting edge technology. We strive to improve the accuracy and efficiency of anglers without restricting their freedom to customize. Think of our products as tools that enhance the systems you already fish with. We pride ourselves in each and every product we produce, which is why every product we sell is unique to the industry and truly one of kind. Freedom Lures gave Bassin’ USA the opportunity to field test their lures over the course of several months. We test for a long period of time in order to get a real feel for the item(s) we are testing. At the beginning of our field test, Freedom Lure only had a small choice of weights to choose from, since that time, they have added more weight options, as well as more products in general. Please visit Freedomlures.com to see all the products they have available. Freedom Lures designed these jig heads to allow anglers to quickly change hook size, shape and style. The hooks have a free range of motion which the manufacturer claims decreases the chance of fish throwing the hook while fighting. This happens to be something that many anglers want. This feature gives some additional side-to-side wobbling action to certain types of soft plastic lures, especially swimbaits. The Stealth model comes with a screw-in lure keeper which slides out of the way when fish strike and helps to prevent your lure from tearing. One of our reviewers found this to be a bit large and long. The jig heads tested by our Prostaff members, are made of lead and have a brass inner chamber that projects sound and houses the wire hook fastener. There are a variety of head designs to choose from (Hydra, Zodiac, Stealth & Rogue) which each have their place for use in various conditions. Skirts provided with the Stealth model were also made from quality material. They are currently only available in two colors Silver Shad and Golden Shiner. One member felt the skirts to be a little on the hard side and not very flexible. In the future we would like to see some more color options available. The Freedom Lures Jig heads were used in a wide range of clarity from crystal clear to stained. Structure and cover targeted were primarily rock, weeds and wood. Lures were tested on Candlewood Lake, CT, Ballston Lake, NY, Hudson River, NY, Lake Champlain, NY, Lake Geneva,WI, Waddington in St. Lawerance and several other smaller lakes and ponds. Water and Air temps ranged from the low 50’s through the mid 80’s. A 7’ Medium Heavy Power St. Croix baitcaster, paired with a Shimano 201e7 reel and 12 pound test Berkley 100% fluorocarbon line. A 7’ Gloomis IMX Rod, Lews tournament speed spool reel 6:3:1, 12lbs test McCoy mean green mono line. A 7’ medium heavy casting rod with 6.1 reel spooled with 17lb fluorocarbon. The Freedom Lures were teamed up with many different soft plastics, such as swimbaits, craw trailers and other soft plastics. Although there may have not been an increase in catching bass, the Freedom Lures do give you an advantage other lures don’t. Being able to swap out hooks and trailers quickly, while keeping the same weight is a real benefit especially in tough conditions. For one, swapping out takes no time at all, getting you back in the game quickly. Second, the ability to make these modifications resulted in more bites for our team. The one thing all the reviews had in common while testing the Freedom Lures was they are good for catching pike, as well as bass. 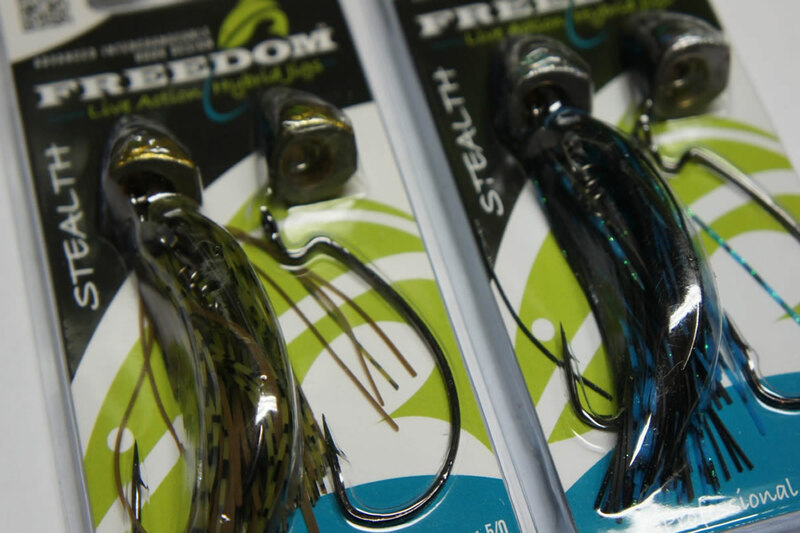 Freedom Lures Stealth Jig appeared to be a favorite by most of the Prostaff members when fishing around the weedlines. One Prostaff member found this to be one of the better jigs to fish around the weedlines and had much success. It would seem that the weight of the jig was an issue. Fishing the Freedom Lures on the edge of rock plies also produced some decent results, with one member catching 4 fish in succession around the 12”-14” range. The swinging action from the hook did cause some problems, such as tangling on the drop. It’s possible that the tangles are due to the hinge point being close to the line tie. It’s important to mention that this happened when using Vertical jigging as a technique and can happen with other jigs. The Freedom Lures do add some additional action to your lure presentation. As one reviewer put it “The “free” swinging hook allows plastics to float up and wag a bit more on the bottom than they do on standard jig heads.” The swinging action adds to the looping motion as the bait is jigged. Although he can’t say for sure that this action increased rates of size of bass caught. Because you can choose your favorite hook styles and many of the Freedom Lures come with EWG style hooks, these jig head are excellent for weed-less applications. All of the Freedom lures that were sent to us came in quality packaging and were constructed very well. Each product looked identical when compared to one another across the various models. The black nickel hooks provided are quality hooks and are very sharp. The paint job on each lure is great. Our Prostaff members love to see how durable products are when they are testing, because in the end it if a product can’t hold up, it’s not worth it. It’s safe to say Freedom Lures did not disappoint. They were banged off rocks, brigde pilings, boats, stealbilkheads, etc. For the most part, our team found Freedom Lures to be extremely durable. Over time the paint does wear away a bit like most other quality heads, but they last much longer. Another great detail about the lures, are the hooks, they stayed sharp throughout the testing period, and most anglers know a dull hook means lost fish. Freedom Lures definitely put a lot of thought into their products, and are forward thinkers. Generally, the hook removal/replacement concept is the best out there. The system developed is beautiful in it simplicity. Throughout each and every jig head there is consistency in the quality of their construction. The extra-large eyelets make it easier to tie. 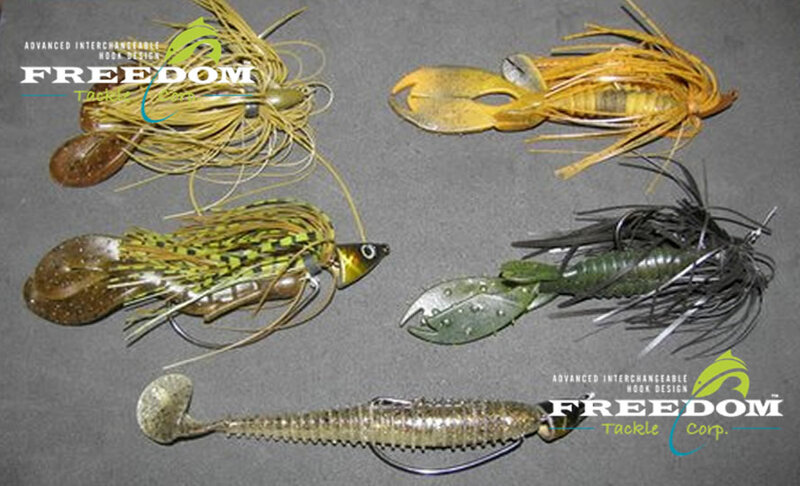 The lead heads of the Freedom Lures are great, but there’s interest in seeing smaller heads using different material. Also, more basic colors, such as black to go along with the designer paint jobs. When you look at all of the “freedom” that you get with these lures, I think it is safe to say they were aptly named for sure. The favorite element of their design is that quick remove hook system. Although there was not a noticeable distinct fish catching advantage using these jig heads over other traditional jig heads, there are angler claims out there that have. They are high quality lures that are very durable. It would be great to see more sizes, weights and colors, which if you go to Freedom Lures.com you you will see more product offering from them. Overall Freedom Lures makes a really quality line of products that give anglers the ability to tweak their presentation to fight the situation. All of our Prostaff members who reviewed these lures would absolutely recommend them to other anglers.